A few weeks ago BMW announced the new R1200GS Adventure, based on the 2013/14 liquid cooled R1200GS. BMW UK have now announced pricing and when accounting for the extra items the Adventure has standard (engine protection bars, spoked wheels), there is a roughly £700 price difference between the two. Other than the bodywork and larger fuel tank, the engine has some minor changes (heavier flywheel) to reportedly make the bike smoother at lower speeds off road. Until I get my greedy hands on one for a test ride, I can't really comment—but from an aesthetic point of view, it looks much larger than the standard model despite similar overall dimensions. Obviously the larger tank makes it visually heavier but it has lost a bit of the tight and clever design work which makes the standard model look smaller than it really is. The bright finish on the tank reminds me of the R1150GS from the early 2000s. Design-wise I really like the black frame, wheels and engine casings—and the little cubbyhole in front of the fuel filler is a useful idea (credit card, Tic Tacs, keys etc). I also like the matt olive colour but the orange graphics seem a little bit more than a nod to a certain orange manufacturer **cough** KTM. I do like the functional, raw look about it but not enough to feel post-purchase regret for getting the standard model. The new BMW R 1200 GS Adventure. The arrival of the new BMW R 1200 GS Adventure marks the start of the next chapter in the success story of the large, boxer-engined GS models that extends back over more than 30 years. Since its debut in 2005, BMW Motorrad, the world's most successful manufacturer of large-capacity travel enduros, has firmly established the big GS Adventure as the definitive machine for long-distance travel. It transports two-wheeled explorers to the farthest-flung corners of the world and allows them to keep pressing on when others have long since turned back. The new R 1200 GS Adventure continues in this same tradition, building on the dynamic performance characteristics and excellent off-road and touring capabilities of the R 1200 GS to provide the new, ultimate solution for globetrotters, travel enduro aficionados and touring riders with a passion for off-road action. The new R 1200 GS Adventure is powered by the same spirited air/liquid-cooled boxer engine featured on the R 1200 GS, with a displacement of 1,170 cc and an output of 92 kW (125 hp) at 7,750 rpm. The stand-out feature of the power unit – introduced last year after being newly developed for the R 1200 GS – is the new precision cooling system which uses water instead of oil as a cooling agent. Also new is the engine's through-flow, which is now vertical for even more efficient power output, as well as the six-speed gearbox that is integrated into the engine housing along with the wet clutch. For the first time on a BMW production motorcycle, the maintenance-free cardan-shaft drive is now positioned on the left-hand side. With the aim of further improving the rideability of the R 1200 GS Adventure, especially on off-road terrain, the drive's flywheel mass has been increased by around 950 grams and an extra vibration damper has been incorporated into the powertrain. The big BMW GS Adventure is something of an icon amongst large-capacity travel enduros and is the top choice for world travellers on long-distance tours, even to the remotest regions of the planet. No matter whether it is negotiating tarmac roads, gravel tracks or rough terrain, the large-capacity GS Adventure gets its riders safely to their destination. This both compelled and inspired BMW Motorrad to make the new R 1200 GS Adventure even better in every way. Like the R 1200 GS, the Adventure is also built around a robust and torsionally resistant tubular steel spaceframe. 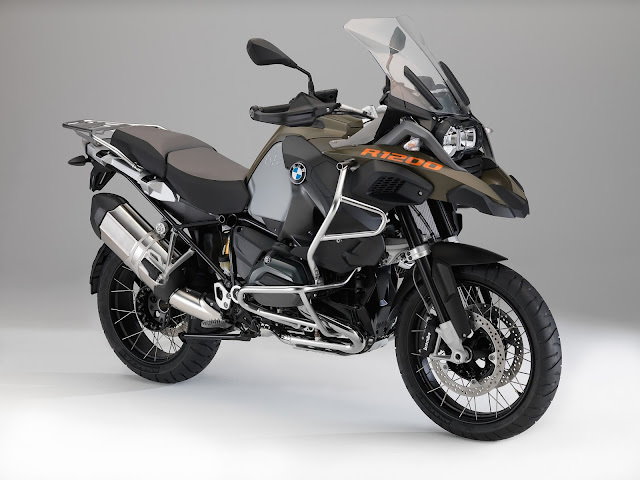 However, it has a larger 30-litre tank (10 litres more than on the R 1200 GS) to allow for an increased range, while the fuel tank itself is now made from lightweight aluminium. The R 1200 GS Adventure already comes equipped as standard with ABS, Automatic Stability Control (ASC), as well as the two riding modes "Rain" and "Road", which enable the riding characteristics to be adapted to most road conditions. This further enhances the range of use of the new R 1200 GS Adventure considerably, at the same time as providing a significant safety boost on slippery surfaces in particular. Besides new bodywork styling with even more masculine flair, the globetrotting abilities and greater off-road expertise of the new R 1200 GS Adventure are clearly brought to the fore by a new chassis set-up with a further 20 millimetres of spring travel, increased ground clearance and a trailing arm with modified geometry for even better handling. A larger windshield with convenient hand-wheel adjustment, additional air flaps as well as hand protectors greatly increase wind and weather protection. Wide enduro footrests, adjustable, reinforced foot-operated levers and completely restyled bodywork add the finishing touches to the look of the new R 1200 GS Adventure. Spring travel 20 millimetres longer at front and rear compared to R 1200 GS. 30-litre fuel tank with similar range to predecessor.